Murder by Gaslight: A Duel in the Bedroom. Will Shinall ran a small store and bar in Hackletown, Georgia, a suburb of Augusta. In the backrooms of the store, he resided with his wife and eight-year-old son. Shinall had business interests in Beaufort, South Carolina and would often travel there and stay overnight. When he was out of town, Shinall left his young clerk and bartender, Batty Buck to manage the store. Though not yet twenty years old, Buck was an honest and enthusiastic employee and Shinall had no qualms about leaving him in charge of the business. But Shinall’s trust had been misplaced; rumors spread through Hackletown that in his employer’s absence, Batty Buck was taking charge of more than just the business— he was sharing the bed of Mrs. Shinall, ten years his senior. Either Will Shinall had heard the rumors and he had observed suspicious behavior in his wife and his clerk, so he decided to set a trap for them. The afternoon of September 11, 1896, Shinall let everyone know that he was leaving for Beaufort and would be staying overnight. He did not go to Beaufort, he stayed in town until midnight then, armed with a revolver, he crept into the backyard and peeked through the bedroom window. Sure enough, there was Batty Buck in bed with his wife. Shinall grabbed an axe handle lying nearby, smashed the window and rushed into the room, pistol in hand. Buck jumped out of bed in his nightclothes and grabbed his own pistol. Within arms reach of each other, the men began repeatedly firing, while Mrs. Shinall sat cowering in the corner. It was reported that the shots could be heard for miles. In the struggle, both men ended up outside the bedroom window. Marshal George Heckle, who lived across the street, found Will Shinall's body covered with blood, lying outside the bedroom window. Before dying Shinall had emptied his pistol into Buck who lay on the ground nearby with five bullets in his body but still alive. He was carried to his home but was expected to die soon. Batty Buck was extraordinarily lucky and managed to live through the effects of the shooting. His luck was still holding that November when his case when to trial and the jury found him not guilty of murder. “Abbreviated Telegrams,” Daily Telegram, September 14, 1896. “Batty Buck Not Guilty,” Columbus Daily Enquirer, November 25, 1896. “Batty Buck's Luck,” State, November 25, 1896. 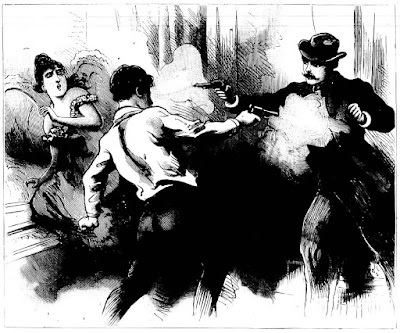 “Fought a Duel in the Bedroom,” National Police Gazette, October 3, 1896. “Husband Shot Dead,” Baltimore Sun, September 15, 1896. “Wire Whispers,” Indianapolis Sun, September 12, 1896.